The Summer Olympics are almost here. I love the Olympics. I am so excited to watch my favorites- diving, gymnastics, soccer and track and field. To celebrate the start of the games we are having a little party this weekend, we are going to watch the opening ceremonies. I am going to be keeping it simple be serving homemade ice cream. I think I will try making the sorbet in the food post below, as well as good old fashioned raspberry. I found a website that gave me a couple of fun ideas. 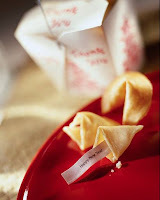 I found a recipe for homemade fortune cookies here, they sound really easy and I think they will be really fun for our Opening Ceremonies Party. I think I may find some Olympic trivia and make a little game out of that. When I think about the Olympics I always think of the Salt Lake Winter games, I have never seen more amazing fireworks.